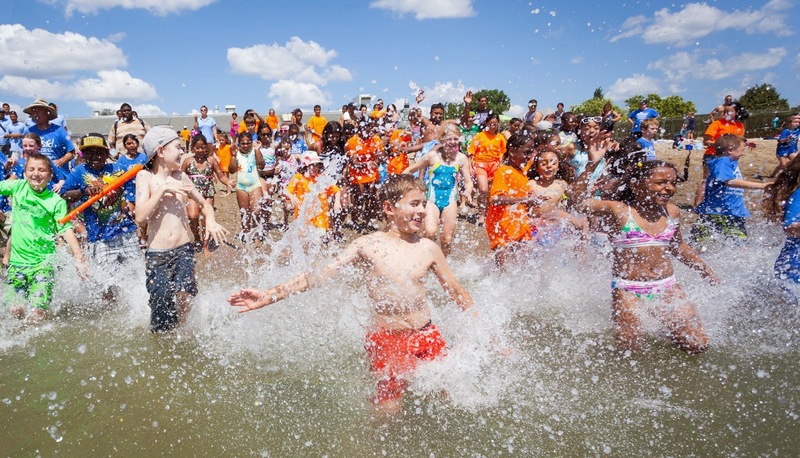 Sea, Sand & Sky: 752 Kids Make A Very Big Splash! It was a perfect day for a beach party. Temperatures in the 80s, clear skies, clean water, 1200 hot dogs, 1000 bottles of water, and 752 Boston area youth and teens added up to a beautiful day of fun in the sun for everyone. At noon, most of the 752 youth and teens hit the water, making a very big splash. Over the course of the day youth and teens engaged in healthy outdoor activities, including swimming, fishing, Frisbee and sports, and enjoyed learning about crabs and lobsters caught and released at the beach. Save the Harbor’s summer artist in residence, Sam Schreiber, helped youth create some spectacular murals and art on the shore. Save the Harbor’s high school and college youth program staff hosted the celebration, and also gathered several hundred signatures in support of their efforts to get better and more affordable access to the region’s public beaches and the Boston Harbor Islands National Park. So far this year Save the Harbor / Save the Bay’s free All Access Boston Harbor program has brought more than 6,000 youth and teens from area community organizations and youth groups on free day trips to the Boston Harbor Islands. The group also serves thousands more youth and teens at 8 program sites around the harbor, and free beach events from Nahant to Nantasket. By summer’s end, these free environmental education programs will have connected 100,000 young people to the Boston Harbor and Boston Harbor Islands since they began in 2002. These free youth environmental education programs are made possible with Leadership Grants from Bay State Cruise Company, Distrigas/GDF SUEZ, The Coca-Cola Foundation, Ludcke Foundation, and the Yawkey Foundation II. Save the Harbor also appreciates funding support from Lawrence J. & Anne Rubenstein Foundation, Arbella Insurance Group Charitable Foundation, Blue Hills Bank Foundation, Blue Hills Bank Pavilion, Boston Center for Youth and Families, Breckinridge Capital Advisors, Carnival Foundation, Circle Furniture, Clippership Foundation, Department of Conversation and Recreation, Paul & Phyllis Fireman Charitable Foundation, HYM Investment Group Inc., Lovett Woodsum Family Foundation, Massachusetts Water Resources Authority, South Boston Community Development Foundation, Reebok Foundation, Santander Bank Foundation, Boston Bruins Foundation, Thomas & Lucinda Foley, Red Sox Foundation, TD Charitable Foundation, Goulston & Storrs, BCYF Curley Community Center, Rowan Murphy & Andus Baker, YMCA of Greater Boston, Matthew J. & Gilda F. Strazzula Foundation, Senior Housing Property Trust, P&G Gillette, BOMA, the Baystate Federal Savings Charitable Foundation, Community-Suffolk, Inc., Eastern Bank Charitable Foundation, and hundreds of individual donors. Save the Harbor/Save the Bay is a non-profit, public interest, environmental advocacy organization working to restore and protect Boston Harbor and Massachusetts Bay. Each year Save the Harbor/Save the Bay runs free youth environmental education programs that combine recreation and hands-on education to bring the Harbor alive for thousands of Boston area young people.